Good question, and one that I do not have a definitive answer to ... but I do have some ideas. "Polite notices" are very unlikely, since as much as 85% of the population was illiterate and would not have been able to read them. Wooden fences are also unlikely, since wood was seldom used for fencing in England, and never on any large-scale project. Stone walls might have been an option, as might hedgerows, but I am inclined to suspect that they were not actually used either. During the Tudor period, there was a great deal of legislation passed regarding the use of royal parks. Hunting of deer and other game by outsiders was strictly prohibited, for example. But I seem to recall that it was acceptable for persons living outside the park to allow their pigs to forage for acorns within the park. Both of those laws suggest that it was fairly easy to get into and out of the park, even for a pig incapable of opening gates. And I know that each royal park had a staff of keepers employed for the primary purpose of watching over the park and making sure that they were not used or misused by persons living outside the park itself. I also know that some landowners marked their property using small stone posts placed at regular distances along the property boundary. So based on limited knowledge on this specific subject, I'm going to hazard an educated guess and speculate that most royal parks, including Greenwich, were not actually enclosed. Instead, the local inhabitants, having lived most of their lives in that same area, would simply have known where the boundary lay and would have known what they could and could not do regarding the park, without needing to be formally told and without needing fences or other structures to remind them. I have to admit that the "polite notices" was a bit of whimsy on my part that Lara kindly indulged. I never really thought it would be that because, as you said, most of the population was illiterate. But I have also read that the purpose of enclosures was to keep the deer in as well as unauthorized people out. That lead me to think that there was something reasonably substantial enclosing the park. If there were stone walls, I would have expected something in the way of archeological evidence of which there doesn't seem to be any. I checked all the contemporary pictures of Greenwich I could find, but nobody seems to have taken any interest in the park, just the palace. Could there possibly have been hedgerows with gates that would allow the general populace access where allowed but also keep the deer in? The more I have thought about this question, I've bcome inclined to revise my response ... especially after Kathy pointed out the possibility that owners migth want to keep the deer in as much as keep others out. It dawns on me that in my travels around the UK, I have indeed seen a goodly number of estates that do have stone or brick walls around at least the "home park" section, or the portion of the estate closest to the main house. Bradgate, for example, has a brick wall around several hundred acres, with the main house in the center. And its famous deer herds do now live within those walls. I assume the walls date to the same time as the construction of the house (1490-1550) since the bricks are of the same color, and the house fell into disuse after 1553. Woburn Abbey likewise has a stone wall around the home park, but the deer park is separate and, if there is any kind of enclosure around the deer park, it is inconspicuous enough to go unnoticed. But as for Greenwich specifically, I just don't know whether or not its deer park was enclosed. I'm sure I'm not the only one here who has the problem of having so many books you forget about some of them from time to time. I bought "The Story of Greenwich" a while back and just now thought about it! From the drawings and paintings and descriptions (at a cursory glance at least) it looks like there was a brick wall with a gatehouse that separated the park from the palace and wooden fences and maybe a tree line that separated other parts of the park. But like Kathy mentioned, all of the images seem to be looking at the palace, so you only can kind of tell what's going on the in the parts of the park near the palace. (sorry for the quality, I don't have a scanner at home right now so I took a photo with my iPhone!). That's interesting, Lara. I believe I've read (though I can't recall where at the moment and can't locate it) that there was a fairly busy street that ran between the palace and the park. If that were so, it would make sense that there would be a stone wall on the palace side of the park and possibly even a guard there. Unless 16th century English deer were shorter and not as good jumpers as 21st century American ones are, I would think the fences would be taller than the one in the picture you posted, though it is hard to get a good idea of scale there. The fence would not need to be "deer high", The deer were well cared for, even pampered, inside it. They would come back on their own if they got out, after feeding on the standing crops of the unfortunate local farmers. One function of the fences was to keep out cattle, sheep, goats, and such, who might compete with the deer for grass and "browse" (leaves from trees and shrubs). As for determined human poachers, a very high stone or brick wall, topped with broken glass (barb wire was far into the future), and/or large, fierce mastiff type guard dogs where the only things that might work. And they only assisted the "keepers". Wollaton Hall in Nottingham (Elizabethan built by Sir Francis Willoughby) has a large wall around most of the 500 acres and includes a deer herd. Today there are busy streets just outside the walls - and the University of Nottingham just across the road. The walls on the University side are very high and thick. I used to walk there sometimes. The red and fallow deer wander freely through most of the park but stay away from the house. Thanks, all. It isn't of earth-shattering importance. I'm writing some fiction that involved Greenwich Park and wanted to get it as accurate as possible. Actually it gives me a lot of leeway since nobody seems to really know the answer. KB, do you know when the wall around Wollaton was built? Did it exist in the Tudor period, or might it have been built later? Got this from the web site of the Friends of Greenwich Park - maybe they can help. 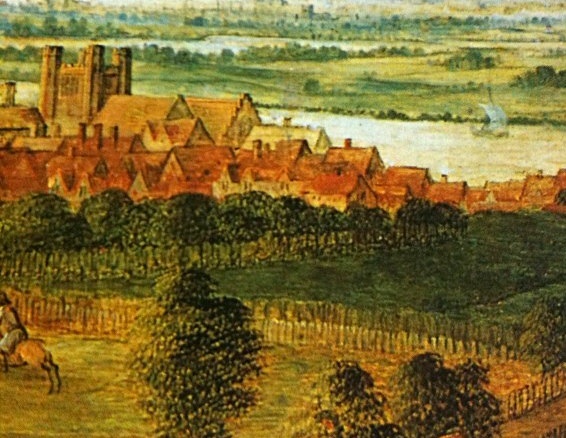 The 'Royal Manor of Greenwich' is listed among the possessions of Alfred the Great in the 8th century but it was not until 1433 that Humphrey, Duke of Gloucester, Henry V's youngest brother, was granted a licence to 'empark 200 acres of land, pasture, weed, heath and furze'.